Nitriding is a thermo-chemical treatment for the introduction of nitrogen to the surface of metal parts. This technology has been employed for many years to increase superficial hardness, as well improve fatigue strength and to improve resistance to wear and corrosion. Generally this surface treatment has been accomplished with no reduction in the core properties of the part. The macro-surface characteristics of sintered P/M parts are different from cast or wrought parts. They have high surface porosity that can cause application problems after gas or salt bath nitriding. Salts remained within the P/M part surface after the treatment. It is normally difficult to remove this salt completely and the residue can adversely effect all associated parts in a finally assembled system. Gas nitriding preclude this problem of residual contamination. However, with gas nitriding it is often impossible to prevent nitrogen penetration to the core of a thin sectioned P/M part, and toughness can inadvertently be reduced. Uncontrolled shape changes during long heat treatments are another problem. Plasma nitriding leaves no residue on the part surface. It effects only the surface of the part, it does not change core properties and guarantees the maintenance of shape dimensions and tolerances. charge carriers for current transport must be available. With pressures of > 0.1 bar this condition is only fulfilled at temperatures above approx. 8000 K. If the pressure is reduced to approx. 1mbar, a plasma can also be produced at lower temperatures. This effect is used during plasma heat treatment. The low pressure plasma makes possible a „high temperature surface chemistry at low parts temperatures“ and opens many process engineering possibilities. For generating a plasma in a vacuum chamber between the parts (cathode) and the receptacle (anode), a voltage of several hundred volts is applied. As a function of the conductivity of the gases used, a certain current density is created by the voltage. Crucial disadvantages of this technology are large temperature differences in a load and therefore large differences in the treatment results as well as a relatively small loading density, high energy consumption and the close interconnection of thermal and chemical processes. A substantial progress could be achieved by the employment of a pulsed discharge. [2,3] Pulsing lowers the energy input into the furnace and the temperature uniformity in the load is improved. Practically all industrial furnaces are today equipped with this pulse technology. External heating (warm wall receptacle) and suitable cooling equipment take over the temperature control of the load. The warm wall concept makes possible a wide uncoupling of thermal and chemical processes and opens new possibilities for the treatment of sintered parts. 1. Sintered parts are heated in pulsed plasma nitriding furnace to remove residual binders and lubricants. A hold step is included to remove all binders or lubricants completely. Time and temperature are dependent on the type and the amount of residuals. 2. The retort is filled with a hydrogen/nitrogen gas mixture. The application of a voltage between the retort and the parts initiates a glow discharge that produces a plasma, an ionized nitrogen and hydrogen layer surrounding the part in a glove like manner. Time and temperature of the nitriding process define the layer thickness. Nitriding is diffusion controlled. Higher temperatures results in thicker layers but with lower surface hardnesses. The type of the compound layer is determined by gas mixtures. 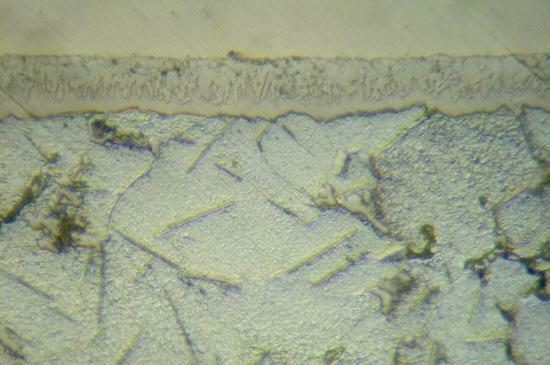 Fig 1 shows a 10 µm thick compound layer of the Fe2-3N type after nitrocarburizing at 550°C for 8 hours. As a result of complete dewaxing the compound layer is formed in a short time without a porous zone. It is generally recognized that P/M parts have some special characteristics compared to parts manufactured form cast or wrought materials. The chemical composition is often quite different from conventional steels. P/M alloys contain copper that can markedly influence the formation of the nitride compound layer. There will be an upper concentration limit for these alloying elements for P/M applications requiring nitriding. Nitride forming elements (Cr, Mo) results in higher hardness. 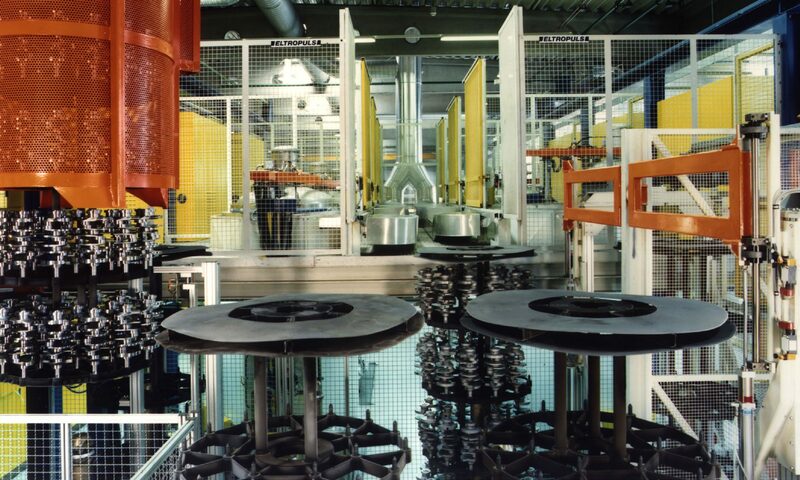 Gears, synchronizers and many othre parts are dewaxed and nitrided in Germany by commercial heat treatment shops using the ELTROPULS technology. Connecting rods are treated in a Brazilian sinter plant in two pit furnace S120/275. Several thousand parts are treated within a cycle time of 12 hours. The variation in compound layer thickness in industrial charges is normally in the range of ± 3 µm, based on the average compound layer thickness measured on several separate parts in the load. Compared with a conventional treatment (dewaxing in inert gas atmosphere and nitriding in several cycles) the ELTROPULS one cycle technology results in shorter cycle times with a better nitriding quality. The amount of porosity in the compound layer is significantly reduced. Furthermore, it is less expensive to install one furnace for dewaxing and nitriding than separate ones for both operations. In the case of a cycle process the handling costs are lower too. Plasma nitriding effects only the surface of the part. It improves the wear resistance used for many powder metallurgical parts. With the ELTROPULS process it is possible to remove lubricants from the calibration process and to nitride in one cycle. The result is an very economical P/M part treatment due to shorter treatment times, lower handling costs and improved quality. Härtereitechn. Mitteilungen 37 (1982) 6, S. 263 – 310.